Women's Geneva Rhinestone-Accented Silicone Watch for Just $5.98 Shipped! You are here: Home / Great Deals / Women’s Geneva Rhinestone-Accented Silicone Watch Just $5.98 Shipped! Women’s Geneva Rhinestone-Accented Silicone Watch Just $5.98 Shipped! Pick up this playful and sparkling accessory! Order a Women’s Geneva Rhinestone-Accented Silicone Watch for Just $5.98 Shipped! 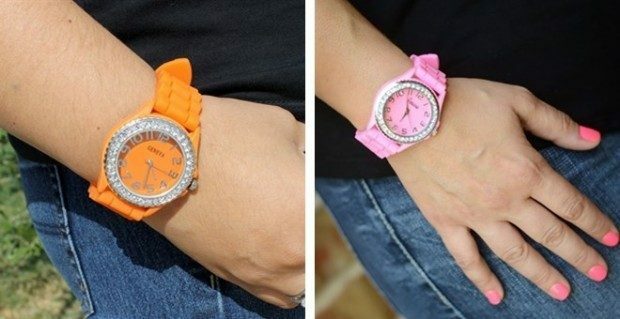 This Rhinestone-accented silicone watches make the perfect lightweight accessory for all occasions- formal or casual! They are available in an assortment of colors to match any outfit every day of the week! !